« How am I? Why do you want to know? 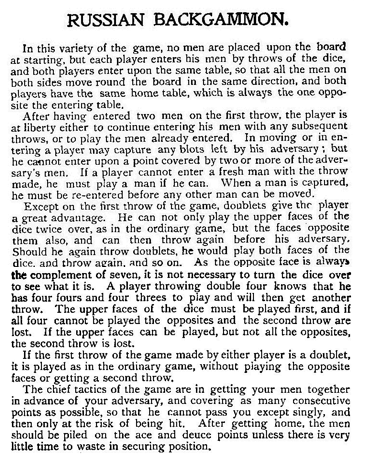 Here are the rules of Russian backgammon, taken from the 1937 edition of Foster’s Complete Hoyle, the standard encyclopedia of game rules. It assumes a knowledge of the basic of backgammon – the movement of the pieces, the method of play, passage around the board and bearing off at the end. These are explained in the pages of Hoyle which precede the rules of this variant. We made three changes to these rules, which distinguish Pamet from Russian backgammon. When a player is blocked and cannot finish the plays allowed him by his dice, the other player completes the play. If that leaves the second player with only one die to play as his turn, so be it. The successive throw after doubles is considered part of the play, so if a player is blocked and cannot finish playing doubles, the other player gets the successive throw on completing the earlier one. If the second player, after using some of the play which passed to him, is also blocked, the play passes back to the first player, who although blocked before may now no longer be blocked because of the changed situation after the second player used part of his throw. The play may go back and forth several times during a run of doubles. A player is not required to maximize his use of the dice. Suppose, for example, that a player who throws a six and a three can move both six and three if he plays the three first, but if he plays the six first would then be blocked and unable to play the three. In Russian as well as English and most other forms of backgammon, this player would be obliged to move the six first, so as to be able to move the three. In Pamet backgammon a player may choose the order of play freely, even if it means losing the play on one of the dice, and could deliberately move the six first and cede the three to his opponent. Often it is strategically useful to do this. But a player who can make the move allowed by one of the dice must make that move – he cannot choose the blocked die first and avoid playing the unblocked die. If a player is completely blocked and cannot make any move, and his opponent to whom play passes is also completely blocked, the opponent makes a fresh throw of the dice. We found by experiment that two factors favor a party – making the first throw, and placing two men on the ace point (the last point on the inner table from which men are borne off at the end). Both of these conditions raised the odds of eventual victory from 1:1 to 2:1. Nothing else (in a game between players of comparable skill, which of course meant only Rosemary and me) correlated to a likelihood of winning. Indeed, no matter how far ahead a player seemed to be, it was not possible to predict victory with any confidence. A well-planned capture, or a run of doubles, could change the strategic situation completely and without warning. A player who had only one man left on the board could eventually lose to a player who had not even put all his men into the end table. This almost total balance, rare among games requiring skill, makes Pamet backgammon unsuitable for betting (one of the main features of the English game), and the doubling cube is not used, because there is no situation (apart from the two just mentioned) that justifies predicting victory for either side. Because a player cannot land on a blot (a point occupied by two of the opponent’s men), and no individual die can advance a man more than six points, a player cannot move his men past a row of six consecutive blots (called a prime). The technique of advancing a prime, and moving men from one end to the other without opening a gap, is one of the special skills of Russian (and Pamet) backgammon. We called it a slime mold. Enticing a single man beyond a potential prime and then closing up behind it, leaving it undefended to pick off at leisure, is a satisfying gambit. As noted in the text, many useful karmic lessons appear in the course of a game of Pamet backgammon. One common lesson is the basic rule, taught by the Buddha, not to rely on structures, because they no sooner form than they begin to decay. They can be valuable in the short run, but we must not forget their ephemeral nature. Rosemary said, and I agree, that Pamet backgammon was at least as valuable as the I Ching as a source of life lessons.